The Ballad of Buster Scruggs opens in limited release on Friday, November 9th and will be available on Netflix on Friday, November 16th. The Ballad of Buster Scruggs probably won’t be the first Coen Brothers movie you recommend to someone. It’s probably not going to be anyone’s favorite Coen movie. And yet Buster Scruggs is a solid introduction to the directing duo’s frequent themes and motifs that comes across clearly thanks to the film’s anthology structure. By seeing what links these six stories together thematically, you can get a clear picture of the Coens’ moral philosophy, grim and unforgiving as it may be. While the tone varies wildly between segments, they all manage to be gripping in their own way, and no short ever overstays its welcome. 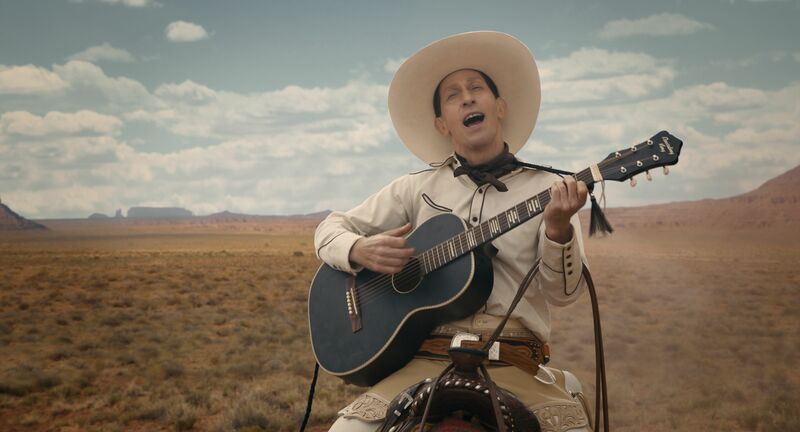 The anthology is divided into six stories: The first, ‘The Ballad of Buster Scruggs’ follows a singing gunslinger (Tim Blake Nelson) who’s rather cavalier about life and death; ‘Near Algodones’ stars James Franco as a cowboy who keeps stumbling into getting himself almost hanged; ‘Meal Ticket’ is a particularly sad story about a limbless performer (Harry Melling) who’s carted around by a gruff impresario (Liam Neeson); ‘All Gold Canyon’ sees a prospector (Tom Waits) disrupting the tranquility of the wilderness to mine gold; ‘The Gal Who Got Rattled’ is about a young woman (Zoe Kazan) who begins a relationship with a trail hand (Bill Heck) on a wagon train; and ‘The Mortal Remains’ sees five travelers in a stagecoach arguing about life, death, and morality. What ties these six stories together, thankfully, is not narrative. One character is not the distant relation to another character, nor is there some plot device or symbolic item that recurs through each story. Instead, the Coens have linked all six stories through sheer force of personality and a heavy emphasis on the fundamental unfairness of life. That may sound like a downer, but for the Coens, the randomness and absurdity of who lives and who dies is part and parcel of our existence, and there’s no better framework for that than the tropes of the western. Each segment starts from a western archetype—the white hat, the outlaw, the prospector, the traveler, the stagecoach, etc.—which then allows the Coens to put their own brand onto those familiar stories. And for Buster Scruggs, that particular brand always links back to death. The moral framework presented in Buster Scruggs won’t be surprising to the Coens’ most ardent fans. Typically, in a Coen movie, you may be fortune’s fool, but if you cross a line, retribution of some sort will come for you. It’s a world where redemption is rare, but the landscape isn’t nihilistic. Choices matter; you just better not make the wrong choices. 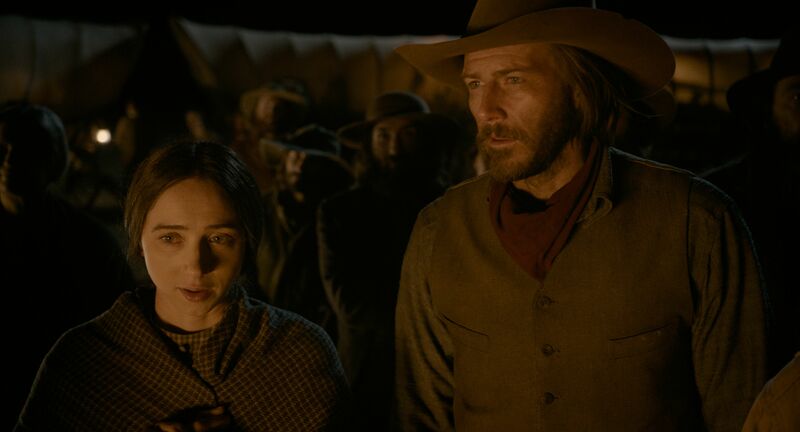 By seeing that moral philosophy echoed through six short Westerns, it helps crystalize this philosophy even if it prevents the kind of deeper dives that movies like Fargo, No Country for Old Men, and others provide. You also have the overall problem of the anthology structure in general, which invites comparison between segments rather than being able to take a story holistically. I’ve been thinking about ‘Buster Scruggs’, ‘The Gal Who Got Rattled’, ‘Meal Ticket’, and ‘The Mortal Remains’ over the past few days, but I could pretty much leave ‘Near Algodones’ and ‘All Gold Canyon’ even though they contribute thematically to what the Coens are going for with the movie. However, even when some of the segments fail to shine as brightly as the others, the film never lost my attention. In comparison to their other movies, The Ballad of Buster Scruggs is likely to be a curiosity. Although it will have a limited theatrical release, most people will see it on Netflix, which is distributing the movie. Its anthology structure also makes it a strange beast, and part of the richness of a Coens movie is getting to spend about two hours with their unique characters rather than just 20 minutes (the short that really suffers from this is ‘Buster Scruggs’, which is hilarious, delightful, and you don’t want it to end). And yet, it feels as essential to their filmography as almost every other movie they’ve done because it hammers home themes they’ve returned to time and again. If you want to show someone who the Coens are as filmmakers, it would probably be better to start with Fargo, Miller’s Crossing, or No Country for Old Men. But if you want to show someone what the Coens believe, The Ballad of Buster Scruggs isn’t a bad place to start.